No structure best depicts affluence and wealth than a high-end, luxury retail complex. The Crescent Mall in Vietnam is the latest addition to a development set to have a huge impact on the infrastructure of Ho Chi Minh City. 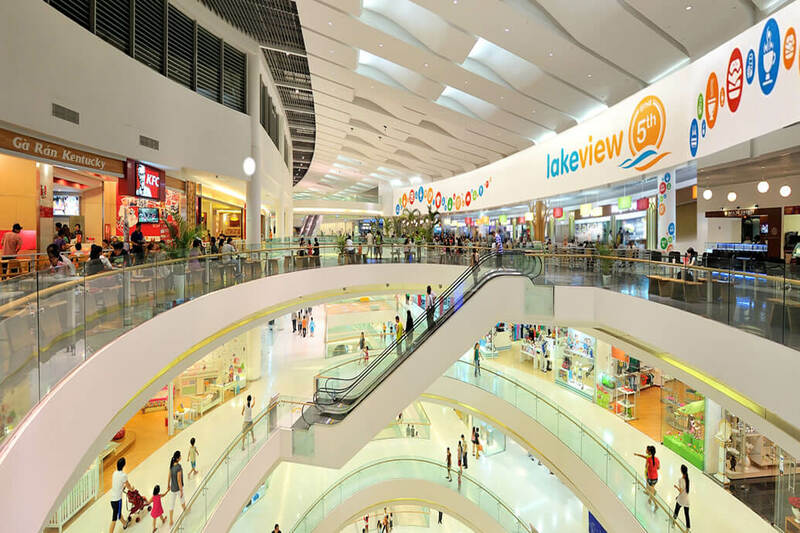 It is true to say that customers at Vietnam’s biggest shopping centre are going to be treated to five-star fire protection as well as a lavish, luxury shopping experience. The new five-story Crescent Mall, which forms part of a multi-complex development at the heart of a new and modern city, has officially opened, complete with the latest in fire and safety control. Located beside Lake Crescent, within Phu My Hung in District 7, the $200 million Crescent development offers 45,000 square meters of prime retail space, 300 premium-serviced apartments, 10,000 square meters of international standard office space and 22,000 square meters of waterfront retail space. This multi-use development is fast becoming the heart of Phu My Hung’s new city centre. Phu My Hung Corporation, one of Vietnam’s leading developers, started development of the 409 hectare Phu My Hung New City Centre over 20 years ago as a vision for a thriving modern city. The execution of the Saigon South master plan – the first multi-complex development in Ho Chi Minh City – has made this district become one of the most desired living destinations in Ho Chi Minh City; it is currently home to over 10,000 households. As Ho Chi Minh City changes and decentralises, District 1, the city’s traditional shopping area is losing its status as the location for shopping malls in the southern region. Developments like the Crescent look certain to become more commonplace as the country’s wealth grows. Retail sales in Vietnam have steadily grown over recent years and as GDP continues to increase, retail outlets are evolving to meet the demand of a population with a growing amount of wealth. A recent report from HSBC predicts that Vietnam will become one of the top 50 economies in the world over the course of the next few decades, predicting that the size of the economy will expand to $451 billion by 2050. One of the most important industries in Vietnam is construction, particularly as urbanisation is fast expanding in areas like Ho Chi Minh City and Hanoi. With that in mind, the construction industry and, in particular, safety legislation has dramatically improved. While equipment and materials being used by the construction industry are in the most part set to international standards, Vietnam’s building regulations are a harmonization of a number of different international codes. The influence of the United States is still strong, as the dominant building code is the American National Fire Protection Association (NFPA), but there is also an influence from Singapore building codes and Australia’s AS codes. Shopping centers, like any retail centre, face substantial public liability for a whole host of risks, from accidents and trips to the risk of fire. Fire in particular is no stranger to shopping malls worldwide and in 2002 Ho Chi Minh City played host to one of its most deadly peacetime disasters, the International Trade Centre fire. The award winning International Trade Centre is an upscale mall with over 400 shops and restaurants and was, at the time, the sole-outpost for high-end designer stores in Vietnam. It was set ablaze following stray sparks from a welder’s torch as work was carried out in the upper level nightclub, inside the building. There were an estimated 1500 people shopping in the mall at the time of the fire, which claimed 60 lives, while 120 people suffered injury. This incident highlights the need for adequate fire and safety control and the benefits of these controls should not be in any doubt in large, complex, multi-occupancy buildings such as a shopping mall. It should also be clear that fire safety and smoke control systems should not just be restricted to maintaining smoke-free staircases and lobbies. With modern building designs, voice alarm systems, emergency lighting and smoke control systems all have a vital role to play in the total fire protection model. From a fire protection perspective, shopping malls are generally the most complicated of retail structures, requiring a fire alarm system sufficiently intricate to provide communication between active systems such as, zoned sprinklers, smoke control provision, secondary power supplies, emergency lighting and manned control centres. The Crescent Mall, like any other retail outlet of its size poses a number of challenges all of which need to be considered in the design process; from egress systems, to the complexity of the fire detection system to ensure the maximum safety of customers and occupants and to maintain the integrity of the building where possible. The systems at the Crescent Mall will protect the thousands of customers that are expected to walk through the mall’s doors each day. The Crescent Mall is typical of a modern shopping centre and involves the installation of a number of systems, many of which operate in conjunction with each other in the event of a fire- related emergency. The fire detection and notification systems in the Crescent Mall have been designed to the Singaporean standard CP10. This standard originates from the widely accepted UK fire standard, BS5839. The design utilises a networked series of intelligent addressable panels together with a combination of intelligent addressable smoke and heat sensors, call points and interfaces that integrate a range of building services, such as the air conditioning, fire dampers and sprinkler systems into a cohesive fire detection and fire protection system. The design was carried out by SPCC, the in-house design operation for the Phu My Hung developer. In general the mall area is protected by intelligent addressable point-type optical smoke sensors, with dual heat/smoke sensors in electrical rooms and heat sensors in the basement car park areas. The mall is also fitted with break-glass call points and visual notification strobes. The detection system is interfaced with a voice alarm system so that, in the event of a fire in any one zone, the system broadcasts a message to that zone plus the adjacent zones. The adjacent zones may well be a different fire compartment either on the same level or levels above and below. The system extends into the tenant shop areas and the system is altered to accommodate the tenants’ fit-out design. The system comprises eight 4-loop rack mounted controllers, internally networked. The entire system operates in Vietnamese. This allows local security staff to operate the system in the comfort of their natural language. The system monitors the sprinkler flow switches and status of the fire pumps. In addition, controls the fire dampers, air conditioning and gas supply across the global cause and effect matrix. In shopping centres and retail outlets, building regulations stress the importance of the provision of life safety systems. The Crescent Mall has a design occupancy of 15,000 people and this can represent a high risk when considering the number of people distributed throughout the building at any one time. Evacuation time for shopping centres can be lengthy. Much depends on the efficiency of the staff to manage the evacuation process and a life safety system that includes a number of elements; fire-detection systems, including manual call-points, electronic smoke and heat sensors that activate audible alarms and that can be programmed to automatically notify local fire departments. For fire suppression, hand-operated fire extinguishers and sprinkler systems should be part of the overall system. Smoke is as dangerous as fire, so a well-designed smoke control system should be provided to maintain smoke-free escape conditions to allow the building to be evacuated with minimum risk of smoke inhalation. Protective measures include the automatic shutdown of ventilating systems and elevators and the division of the building into areas that are free from smoke. Occupants evacuate through smoke control protected exits. The need to evacuate only the area of the mall affected by fire has resulted in an intricate system to ensure that fire can be detected in the early stages, the right areas are evacuated and the right systems are in the right part of the building. For example, smoke curtains and smoke extract operate to maintain the ‘open’ mall area as a place of comparative safety. The “cause and effect” plan was agreed during the design process, and is developed from an agreed life safety system. This plan was agreed with local building control, and is designed to be robust throughout the life of the mall. Any deviation from, or change to, the plan should not be made without proper consideration being given to the affect that any such deviation or change would make to life safety. Building to international standards is becoming easier in developing countries, aided by the growing infrastructure and a better understanding of building codes. Systems are being developed and produced in local languages, which aids the security of customers and staff managing the building. A large development like the Crescent Mall poses a variety of risks and challenges. Guidance from the international fire community and experienced suppliers ensures the safety and longevity of the building and those who use it. While international manufacturers supply into emerging markets such as Vietnam, the challenges to complete projects, such as the Crescent Mall, are substantial. Training of the contractors is key and appointing a local distributor is essential to ensure language and cultural differences do not inhibit the completion of an important part of the building services. For example, MP Co., the local distributor for the Crescent Mall, employs engineers certified by Cooper who then project manage the installation and commissioning of the system. As emerging markets develop, and local skill levels lag that of developed countries, an active involvement from concept design to final commissioning with local contractors and designers ensures this development meets the international standards and offers the protection expected in such a major development. For fire suppression, hand-operated fire extinguishers and sprinkler systems should be part of the overall system. Smoke is as dangerous as fire, so a well-designed smoke control system should be provided to maintain smoke-free escape conditions to allow the building to be evacuated with minimum risk of smoke inhalation.